Facebook is rolling out modifications to its privacy settings in response to the recent influx of user complaints. According to founder Mark Zuckerberg, Facebook needs to continuously update itself in order to accommodate its exponential growth. Some of the recent changes, especially those dealing with privacy settings, have been met with controversy. 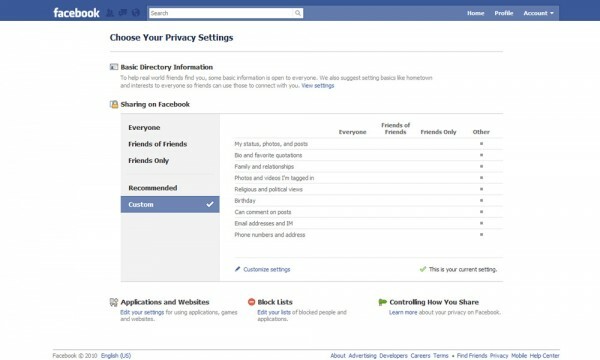 The new updates aim to offer more privacy controls and limit 3rd party applications from accessing personal information. As it stood before, Facebook’s privacy settings were cluttered with many confusing and highly specific options. On the other hand, the new settings are simple and intuitive. Any changes users make to their privacy settings are now displayed on a simple grid, which should make managing information a lot easier. The idea behind the change is to make it practical for users to control what appears on their profile page. At first glance, it may seem that Facebook is dumbing itself down by limiting options; however, they have still left their granular settings intact for tech savvy users. I personally would rather switch to the new simple control setting which offers controls to what information gets displayed with just the click of a few buttons. As users know, Facebook has released a number of updates over the past few years. Just about every time a new update came out, most privacy settings would revert back to the default, forcing users to reset all their preferences manually. Thankfully, Facebook has now promised to carry over previous privacy settings even when they release any new updates in the future. Additionally, Zuckerberg stated that he will try his best to limit privacy related changes. These new privacy settings encompass changes that will help both the casual and rigorous Facebook user by making privacy settings more permanent and easy to use. The second goal of the new updates is to limit the ability for people and applications to access or reveal personal information. This couldn’t have come at a better time. I’ve always found it disturbing that if users weren’t careful enough, applications could easily gain access to personal data such as addresses, phone numbers, and much more. To make things even scarier, applications your friends install also had the ability to gather your personal information, even though you didn’t install them! Due to these changes, if you search for someone now, the only things you will be able to view are the person’s name, profile picture, gender, and networks. Additionally, applications need to explicitly ask for your permission before using your personal information in any way. Perhaps the most significant change to Facebook is that users can opt to turn off Facebook Platform applications, which will lock down data access for 3rd party applications. Facebook seems to now be going for an easier set of privacy options, but is still “opt out” meaning that the default settings are not fully secure. With this in mind, you should still go to your privacy settings and set it to whatever you feel is appropriate. I can’t say that I’m disappointed by this, but I’m still waiting for the day that Facebook chooses an opt-in over an opt-out policy. Although Facebook released its changes a few days ago, users can expect a delay of a few weeks before their accounts actually switch over. Users should watch for a notice on the homepage explaining the changes when they login to their account. Although social networking sites can be fun and useful, they also have the potential to be very dangerous. These relatively small changes address key privacy issues that should have been fixed a long time ago. As Facebook continues to grow, protecting personal information from other users and applications becomes more and more important. With that in mind, the updates are definitely a step in the right direction. What do you think of the updates? Let us know in the comments! I just hope in the end that the privacy settings are easier to use and understand. It is pretty complicated (and confusing) as things are at Facebook.